Dentons' lawyers have deep-rooted experience with PPPs. We have assisted public owners, concessionaires, lenders and contractors with all aspects of PPP arrangements across a broad range of infrastructure sectors. We have leading PPP lawyers in jurisdictions that have been most active in these partnerships, including those in the United Kingdom, Europe and Canada. Whether you are involved in transport or utility, roads or accommodation we have experienced lawyers who can assist you. Agence des partenariats public-privé du Québec: Acting as legal counsel on the modernization of Montréal’s University Health Centers (CHUM, MUHC and Sainte-Justine UHC) and drafting all contractual arrangements (risk identification, risk spreading, contractual obligations). Large provincial health authority: Advising in relation to their C$1 billion building program including a new hospital, renovations to existing hospitals, speciality health services facilities and other infrastructure such as parkades. AltaGas Ltd.: Advising on the development and construction of the 195-megawatt Forrest Kerr Hydro-Electric Project and connection to the Northwest Transmission Line Project in British Columbia. Korea Electric Power Company, Mitsubishi Corporation and Wärtsilä: Advising a consortium comprised of Korea Electric Power Company, Mitsubishi Corporation and Wärtsilä on all legal aspects, including financing, of their successful bid to Jordan's National Electric Power Company (NEPCO) to develop a Wärtsilä tri-fuel engine-based power plant of 600 MW at Almanakher, Jordan on a build, own and operate basis. BC Hydro Site C Clean Energy Project: Advising with respect to finance, construction, procurement and commercial matters on the Site C Clean Energy Project, an 1100MW hydroelectric project near Fort St. John, British Columbia, with capital cost estimate of CA$8.335 billion. Bouygues Bâtiment Ile de France: Advising the lenders of the consortium on a partnership contract for the financing, design, construction and maintenance of the future Paris courthouse (valued at €575 million), which will house the Tribunal de Grande Instance, the police court, the public prosecutor’s office, and Paris district courts. The 48-story, 160-meter-long building will be a unique example of sustainable urbanism, and is one of the largest justice projects in France, if not globally. The project, expected to be completed in 2017, involved seven international lenders and achieved financial close just months after the preferred bidder was selected. Large Canadian municipality: Advising on procurement, contract and dispute issues for the owner. Resolved multiple disputes using negotiation, mediation and litigation. CNIM S.A.: Advising the French engineering and construction company on the drafting, negotiation and implementation of a Fédération Internationale Des Ingénieurs-Conseils (FIDIC) design-build-operate contract, adapted to conform with Azerbaijani law, for the construction and operation of a €346 million state-of-the-art waste-to-energy incineration plant in Baku, and related corporate, commercial, administrative and employment work. Infrastructure Québec and the Ministère des Transports du Québec: Advising on the design and construction of the main infrastructure of the Turcot Project in Montréal, a C$3 billion project. Birmingham City Council: Advising the mandated lead arrangers (MLA) of the Birmingham Highways Maintenance Private Finance Initiative Project. Birmingham City Council wanted to transfer the risk of upgrading, operating and maintaining its highway network. Amey Ventures Ltd. was appointed by the council to deliver this £2.8 billion project. Having previously advised the UK Highways Agency on 12 privately financed design/build/finance/operate road projects, including the M25 London orbital motorway, as well as private sector consortia and lenders on roads projects around the world, we were appointed to advise the MLAs on the project. We successfully advised them on a range of complex commercial, legal and financial structuring issues. The project was given the European PPP Deal of the Year 2010 award by Project Finance International, with our team being nominated for Infrastructure Journal's Transport category award. The project is now delivering an improved highway network in Birmingham and the certainty of a long-term maintenance program. Eko Rail Company Limited: Supporting its successful bid to operate the new rail system. This project involves substantial track and station fit-out works, operation and maintenance, rolling stock supply and project financing sourced from a range of international banks, equity investors, local banks, development finance institutions and export credit agencies (ECAs). This project shows the strength of the Firm's rail practice in Africa and other emerging markets, and synergies with its well-respected Project Finance practice. Government of Canada: Acting as senior procurement and construction counsel on the Royal Canadian Mounted Police (RCMP) Division E Relocation Project, as well as acting as counsel to the Department of Justice on behalf of Public Works and Government Services Canada and the RCMP. This was the first major accommodation project in Canada that achieved financial close in April, 2010. SNC-Lavalin Capital: Acting as counsel in connection with their bid to design, construct and operate the final phase of the Anthony Henday Drive Project in Edmonton, Alberta. SNC-Lavalin Capital is a division of SNC-Lavalin Inc. and John Laing Investments Limited. Leading international infrastructure development and management company: Acting as counsel in regards to the design-build joint venture of Halton Hospital, an Ontario accommodation P3 project. Dragados: Acting as counsel on the design-build joint venture for the Fraser Transportation Group (led by Dragados) regarding the South Fraser Perimeter Road (Gateway Program) highway project, which achieved financial close in July 2010. Leading international investment bank: Acting as a local legal advisor in Ukraine on a US$930 million loan to the State Road Administration of Ukraine (Ukravtodor) under sovereign guarantee. Our lawyers also provided their legal assistance in connection with further loan restructuring. Energia-Overseas: Advising a Russian client in DIP financing and funding the reorganization plan through the acquisition of 95% of the common stock of Sea Launch Sàrl, successor to Sea Launch Company, LLC. Sea Launch is the world’s only provider of commercial satellite launch services using a mobile sea platform. EOL’s $155 million equity investment and $45.7 million DIP loan conversion allowed Sea Launch to emerge from Chapter 11 and migrate from Delaware to Luxembourg and establish operations in Bern. The investment required the Committee on Foreign Investment in the United States (CFIUS) approval as well as Luxembourg and Swiss approvals. Gmina Miasta Sopotu: Advising, in cooperation with the law firm KSP, the popular seaside resort town of Sopot, near Gdansk, on the preparation and implementation of a city center revitalization project involving a Public-Private Partnership. The €50 million project includes the revitalization of the railway station, owned by PKP (the Polish railway company), and the approx. 17,000m² of neighboring city center areas, as well as the construction of commercial facilities (hotel, shopping center, office buildings, parking lots, etc.). This was the first PPP revitalization program in Poland, and it was awarded “Best PPP Project” in the 2009 Good PPP Practices Competition (Konkurs Dobre Praktyki PPP), which the city of Sopot won in the category of municipal infrastructure. Région Alsace: Assisting the local authority of the Alsace region in preparing and conducting a tender for the award of the first Energy Performance Contract (EPC) in France. The €40 million project consists of the renovation of 14 high schools in Alsace to improve energy efficiency. Its aim is to reduce primary energy consumption by some 35% and lower greenhouse gas emissions by as much as 65% (90,000 tons of CO2 saved during the term of the contract). Nevsky Meridien Consortium: Advising a consortium led by Bouygues Travaux Publics and Strabag AG on a tender for the construction/concession contract for the 46km Western High Speed Diameter Ring Road in St. Petersburg, Russia, the largest PPP project of its kind ever undertaken, with a projected construction cost of over €3 billion. This was the first PPP under the Russian concession law and, as such, set the tone for all PPPs in Russia, and it was also a first in terms of engineering complexity and the size of the undertaking on a PPP basis. This became a landmark deal in Russia, but also a landmark for transport PPP markets globally. Dentons is proud to congratulate the entire Ohio State University Comprehensive Energy Management Project team for winning the IJGlobal North America Social Infrastructure and Overall Deal of the Year Award. 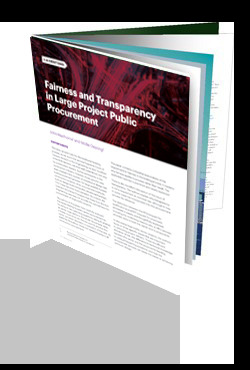 At the core of any procurement are two fundamental elements: the description of what bidders are required to submit as a bid, and the description of how the owner will judge the bids to select the winner. Intuitively, all bidders should be invited to submit the same information, and the owner should use the same criteria in judging the bids. The Public Private Partnership Act No. 19 of 2010 (the Act) is the principal act made for the purpose of providing an institutional framework for the implementation of public private partnership (PPP) agreements. The Act outlines the rules and procedures of the procurement process and development of public and private sector partnerships.